“Without visas!” reads this poster in Kyiv, celebrating Ukraine’s visa-free regime with the European Union, which comes into force this month. Photo (c) Serg Glovny/Zuma Press/PA Images. All rights reserved.After a rollercoaster ride of seemingly endless delays, foot-dragging and dashed hopes, visa-free travel to the EU has finally become a reality for Georgian and Ukrainian citizens. A political climate hostile to immigration among EU states turned the rather technical procedure of lifting restrictions on short-term visas into a highly politicised ordeal. Concerns over the supposed threat of increased irregular migration and organised crime based largely on anecdotal evidence were used as an excuse by certain EU member states to stall the process and push through a much harsher visa suspension mechanism for all third countries that enjoy visa-free travel to the EU. As part of its strategy of externalising migration controls to third countries, the EU can now swiftly reinstate visa requirements if third countries fail to, for example, accept rejected asylum seekers or effectively prevent the transit of irregular migrants. Despite these concessions, Georgia and Ukraine have undoubtedly scored a significant symbolic victory. After all, it was Yanukovych’s refusal to sign the EU Association Agreement that acted as the initial catalyst for the Euromaidan protests. While the visa waiver for citizens of these post-Soviet states represents a welcome opening in Europe’s “soft” paper curtain with its eastern neighbours, there is little impetus for states in the region to continue European integration or uphold human rights given the EU’s preoccupation with protecting its external borders from migrants and asylum seekers. Delivering on visa liberalisation may be a short-term win for the current governments in Georgia and Ukraine. But this new relationship can neither ensure public support for the EU, nor prevent democratic backsliding in the future. Visas are the subject of endless online and offline discussions for citizens of post-Soviet countries that happen to be beyond the EU’s pale of free movement. Although there is officially a common visa policy among Schengen states, there are also discrepancies between these formal rules and informal practices at various EU embassies. This has generated much confusion and uncertainty among applicants. Obtaining that coveted multi-entry Schengen visa became a competitive sport for many independent travellers, with people posting tips and exchanging advice on how to deal with different EU embassies on social media and dedicated travel forums. From Belarus to Kazakhstan, young people posting grinning selfies of themselves next to Schengen visas in their passports is a testament to the extent to which visas have become fetishised objects in their own right. 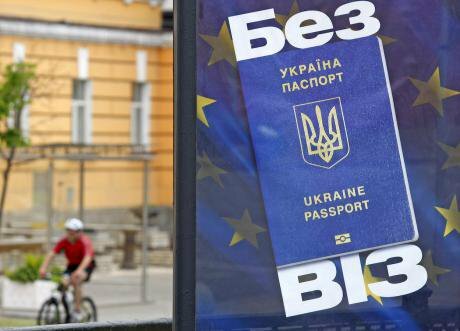 To add insult to injury, Ukrainians in particular were subject to regulations that required them to check-in in person at EU embassies and get their passports stamped upon returning from their trip abroad. Back in 2011, there were multiple reports of consulates forcing Ukrainian citizens to leave behind deposits (in the form of personal documents or money) to ensure they would not overstay their visas. These measures, which were condemned by Ukrainian civil society organisations such as Europe Without Barriers, made obtaining a Schengen visa a thoroughly humiliating, time-consuming and frustrating procedure, particularly for young, independent travellers and those with limited financial means. “The Old World at the end of the tunnel: what the visa-free regime with the EU will give Ukraine." RT Russian article on Ukraine’s new visa regime. Source: RT.As hard as Kremlin-sponsored media are trying to downplay visa liberalisation as a minor accomplishment that will supposedly only benefit the country’s wealthy, globalised elites, the mere fact that an entire restrictive and complex bureaucracy will practically disappear is by itself a momentous occasion for Ukrainians and Georgians. While EU border guards will retain the right to refuse entry to visa-free travelers who fail to present evidence of an intent to return, experience shows that these regulations are only sporadically enforced. Since the entry into force of the Moldova-EU visa-free travel agreement, for example, less than two percent of Moldovan travellers were denied entry to the EU and just 0.23% of Georgian visitors were turned around at the border since visa liberalisation became a reality for Georgia. The Russian government, which itself has engaged in visa liberalisation talks with the EU in the past, is very much aware of how coveted visa-free travel is for many of its citizens. The lifting of visa restrictions is undoubtedly a PR victory for pro-European forces in Georgia and Ukraine — at least in the short term. The road to visa liberalisation for Georgia and Ukraine was arduous and plagued by delays as the EU appeared to shift the goalposts for finalising the deal on multiple occasions. Whereas Moldova was granted visa liberalisation on schedule based on broad support at the EU level, visa liberalisation negotiations with Georgia and Ukraine were hampered by hardening stances on immigration and mobility on the part of many EU member states in the context of the so-called refugee crisis. In fact, resistance on the part of some of the most influential EU member states such as France, Germany and the Netherlands threatened to sabotage the entire process, sapping the patience of Georgian and Ukrainian officials and weakening public trust in the prospect of imminent visa liberalisation. Unsubstantiated arguments about the dangers of an influx of irregular migration and criminality was used as justification for stalling negotiations in the same way as France, Germany and Netherlands had stalled visa liberalisation for the Western Balkans several years prior on the basis of the high number of asylum claims emanating from the region. As with Western Balkan countries, the EU developed detailed visa liberalisation road maps for Ukraine and Georgia. These required the implementation of a broad package of reforms on external security, migration governance, defence of fundamental rights and the fight against corruption. These prerequisites for visa free-travel fit into a broader logic of conditionality whereby the prospect of the lifting of visas should be used as an incentive for upholding democratic norms and the rule of law. While at least rhetorically, the EU has tied visa liberalisation to respect for democracy and human rights, the main emphasis of the required reforms is harmonisation with the EU on security and migration control. 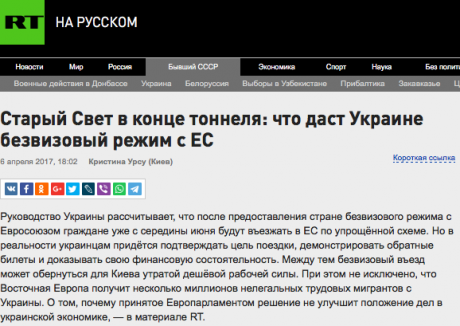 Thus, as part of the EU’s push to externalise immigration control to neighboring countries, Georgia and Ukraine were forced to sign readmission agreements. These agreements oblige them to readmit not only their own citizens, but also third-country nationals — a potential burden in the case of an uptick in the irregular transit of persons across their territories. The EU also used the opportunity of visa liberalisation negotiations with Georgia and Ukraine to revise existing regulations by pushing through a much stricter visa waiver suspension mechanism that now applies to all existing visa liberalisation agreements. This would allow for visa-free travel to be frozen on short notice upon the recommendation of the Commission or an EU member state. This threat acts as a negative incentive for Georgia and Ukraine to stringently police irregular migration and uphold strict border controls. The negotiation procedures have clearly demonstrated that for the EU conditionality is first and foremost about cooperation on migration enforcement and border protection. 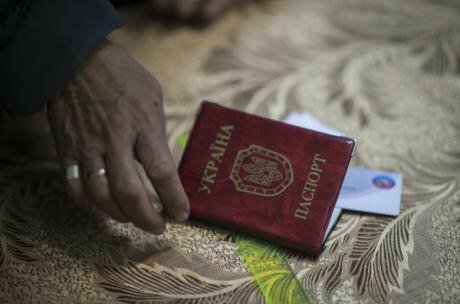 A resident of Luhansk presents a Ukrainian passport at a polling station during elections for members of the People’s Council of the self-declared republic in November 2014. Photo (c): Valery Melnikov / RIA Novosti. All rights reserved.The symbolic value of visa liberalisation as a tangible benefit of European integration has meant that Georgian and Ukrainian officials were extremely motivated to fulfill the technical requirements for joining the visa-free club. Once the goal has been reached, however, governments have little incentive to actively pursue reforms and further integration. As the first Eastern Partnership country to successfully obtain visa-free travel to Europe, Moldova is both a poster child and a warning for visa-free candidates. For Georgia and Ukraine, Moldova acts as an example of the extent to which the prospect of visa-free travel can act as an incentive for people living in breakaway republics and occupied territories to apply for passports of the respective internationally recognised governments. Indeed, Tbilisi had hoped that visa liberalisation could make Georgian passports a more attractive prospect for residents of breakaway Abkhazia (officials in Sukhumi turned up their noses). There are precedents, however. Throughout the year after Moldova’s visa-free regime with the EU entered force, some 27,000 citizens of Transnistria applied for new biometric Moldovan passports. Time will tell whether residents of Russian-occupied Crimea are also as enthusiastic (unless they have officially renounced their Ukrainian citizenship, they are also free to apply). But while both Georgia and Ukraine have reaffirmed their commitment to allow people living in breakaway regions to obtain biometric passports, it is questionable to what degree the utilitarian benefit of visa-free travel to Europe will lead to a change in allegiances among populations living in unrecognised republics. Set against the background of a smoothly functioning visa-free agreement with the EU, Moldova has concurrently witnessed a rise in Euroscepticism and anti-western attitudes amid democratic backsliding in the country. Visa liberalisation is therefore neither a guarantee of further European integration, nor a vaccine against authoritarianism. Ukraine and Georgia may have successfully fulfilled all the technical requirements for visa liberalisation. But concerns remain about the extent to which these reforms will be structural rather than superficial. In Ukraine, for example, it took several attempts and strong pressure from civil society, the EU and President Poroshenko for the parliament to finally pass (albeit through gritted teeth) a watered down anti-discrimination amendment to the country’s Labour Code explicitly prohibiting discrimination on the basis of sexuality and gender. December 2015: Buildings across Georgia are lit up with the European Union flag as the government pushes for visa-free. Source: Youtube. While these perfunctory changes to legislation were enough for the EU to give Ukraine the final green light for visa liberalisation, they will do little to actually protect LGBT rights. In fact, ever since it became clear that the visa-free liberalisation was irreversible, rumours have been circulating that these amendments could be reversed. Anti-corruption campaigners and human rights activists in Ukraine are already raising their voices about an ongoing effort by some members of the Ukrainian government to undo or sabotage ongoing reforms with the passing of a new amendment imposing a heavy administrative burden on NGOs combined with attempts to undermine the National Anti-Corruption Bureau (NABU). After delivering on the promise of visa-free travel, Ukrainian and Georgian governments lose an important incentive to deepen reforms, uphold the rule of law and protect human rights. Indeed, we have seen this pattern in the Western Balkans. Here, governments have backpedalled on promises to uphold democratic values with recent crackdowns on the media in Serbia and violence erupting in the Macedonian parliament to impede the peaceful transition of power. Embroiled in its own political crisis, the EU remains dangerously aloof and has failed to forcefully condemn anti-democratic developments in partner states. Instead, the EU appears to be primarily preoccupied with cracking down on irregular migration, keeping the number of asylum applicants low and the rate of return high — all with the help of neighbouring countries. In its drive to limit migration at all costs, the EU has recently signed an agreement with Belarus to “manage migration flows” (a thinly veiled euphemism for keeping out migrants and refugees). This is despite the Lukashenka regime’s abysmal human rights record and its policy of cooperating with repressive regimes in the post-Soviet space on the extradition of political dissidents and asylum seekers. As long as countries like Georgia and Ukraine cooperate on migration, the EU will likely look the other way when it comes to democratic norms and human rights. The recent illegal extradition of an Azeri dissident from Georgia to Azerbaijan, allegedly by Azerbaijan's security services, is a worrying example of the type of human rights abuses that could increase in number in the absence of diplomatic pressure from the EU. Moreover, the flagrant violations of international law with regards to asylum seekers on the part of EU member states such as Poland and Hungary further erodes the credibility of the EU’s willingness to protect fundamental human rights — both internally and abroad. While the current euphoria over visa-free travel to the EU will continue into the summer, the question of labour migration to the EU remains the awkward elephant in the room. Indeed, the EU remains unwilling to expand legal migration channels to the EU, but access to the European labour market remains a priority of job-seekers from Georgia and Ukraine. A former member of Saakashvili’s government has already called on Ukrainian and Georgian officials to actively push for privileged access to the European labour market. Poland, for example, already has simplified employment procedures for citizens from Armenia, Belarus, Georgia, Moldova and Ukraine. With over 1.3 million Ukrainian citizens currently working on its territory, Poland is increasingly dependent on migrant labour from the east despite the current government’s xenophobic hostility towards refugees and non-white migrants. It is possible that other EU states, particularly in Central and Eastern Europe, will follow suit and provide bilateral access to their labour markets in the future. Visa liberalisation is undoubtedly a cause for celebration for regular Georgians and Ukrainians. But their respective governments should not expect to indefinitely ride on the coattails of this success. Governments should aim to keep citizens updated about the nature of visa-free programmes; data last year revealed that many Georgians remained poorly informed. Given the continued lack of economic opportunities in Georgia and Ukraine, pushing for access to the European labour market will remain an uphill battle in the context of an EU that is increasingly less interested in promoting labour mobility. Furthermore, when migration control objectives take precedence over human rights considerations and democratic values (as is currently the case when looking at the EU’s external policies), there is a real danger of post-Soviet states walking back on their commitments to meaningful democratic reforms. Ultimately, using Georgia and Ukraine as buffer zones against irregular migration not only jeopardises these countries’ futures, but undermines the credibility and legitimacy of the EU as a political actor.